Are hot dogs healthier without added nitrites? Backyard cooks looking to grill this summer have another option: hot dogs without "added nitrites." 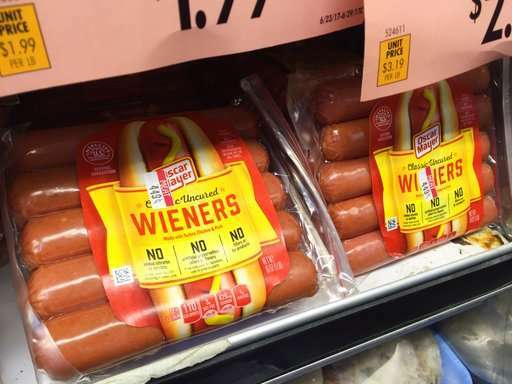 Oscar Mayer is touting its new hot dog recipe that uses nitrite derived from celery juice instead of artificial sodium nitrite, which is used to preserve the pinkish colors of processed meats and prevents botulism. 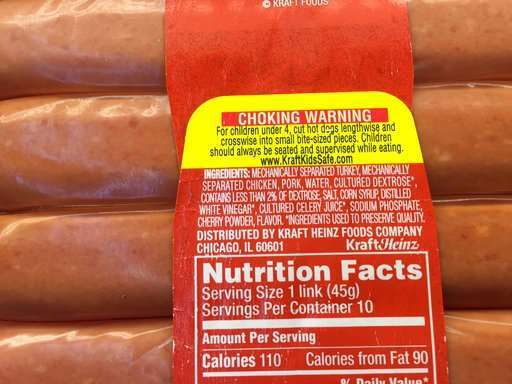 Kraft Heinz, which owns Oscar Mayer, says sodium nitrite is among the artificial ingredients it has removed from the product to reflect changing consumer preferences. The change comes amid a broader trend of big food makers purging ingredients that people may feel are not natural. But nitrites are nitrites—and the change makes little difference—according to those who advise limiting processed meat and those who defend it. Kana Wu, a research scientist at Harvard's school of public health, said in an email that it is best to think of processed meat made with natural ingredients the same as those made with artificial nitrites. Wu was part of a group that helped draft the World Health Organization report in 2015 that said processed meats such as hot dogs and bacon were linked to an increased risk of colon cancer. She notes WHO did not pinpoint what exactly about processed meats might be to blame for the link. One concern about processed meats is that nitrites can combine with compounds found in meat at high temperatures to fuel the formation of nitrosamines, which are known carcinogens in animals. It's a chemical reaction that can happen regardless of the source of the nitrites, including celery juice. But the U.S. Department of Agriculture caps the amount of artificial nitrites that can be added to meats to prevent excessive use, said Andrew Milkowski, a retired Oscar Mayer scientist who consults for the meat industry. Meat makers also add ingredients to processed meat like bacon that help block the formation of nitrosamines, he said. Though the terms nitrates and nitrites are used interchangeably, the meat industry says it's mainly sodium nitrite that companies currently use to cure meats such as hot dogs, cold cuts and bacon. For Oscar Mayer hot dogs, the packages now list ingredients like celery juice that has been treated with bacterial culture. That turns the naturally occurring nitrates in celery juice into nitrites that serve a similar purpose. While the nitrites derived from celery juice are no better, the switch may nevertheless help address negative consumer perceptions, said Milkowski, who also teaches at the University of Wisconsin's department of animal sciences. The Center for Science in the Public Interest agrees nitrites from natural sources aren't that different from artificial nitrites in processed meats. But the group has cited the WHO report in calling for a cancer warning label on processed meats, regardless of how they're made. It also says nitrite-preserved foods tend to be high in salt and should be limited or avoided anyway. The American Cancer Society also suggests limiting processed and red meat, citing a variety of reasons. The meat industry has contested the WHO's finding, saying it is based on studies that show a possible link but don't prove a cause, and that single foods shouldn't be blamed for cancer. Many health experts also say there's no reason to worry about an occasional hot dog or bologna sandwich. And while natural preservatives may not make hot dogs any healthier, they fit with the growing preference for ingredients like celery juice that people can easily recognize. "I think it's a step in the right direction," said Kristin Kirkpatrick, a dietitian at the Cleveland Clinic. An interesting wrinkle worth noting is that federal regulations require processed meats without added nitrites or nitrates to be labeled as "uncured" and to state that they have no nitrates or nitrites added—except those naturally occurring in the alternative ingredient. That's the language you'll now find on Oscar Mayer hot dog packages, though the products previously only had added nitrites. The meat industry has contested the required language of meat being "uncured," because it says the products are still cured, albeit with nitrites derived from other ingredients.